How to save on cell phone calls with SmartReach? How can I save on local cell phone calls with SmartReach? What is â€œunlimited calling to five numbersâ€�? What are the local SmartReach access numbers that I can call? Are there any limitations to the five numbers feature? How to make a call from a cell phone using SmartReach? the number of digits that I need to dial? Register for an â€œunlimited calling to five numbersâ€� service offered by your cell phone provider. Add the SmartReach access number to your â€œunlimited calling to five numbersâ€� list. Use SmartReach to make all local calls at 1.9¢ a minute. Most cell phone providers in Canada offer unlimited local calls to and from five numbers of your choice. This feature is either included free of charge in your monthly cell plan or offered as an add-on at a low fee. You should be able to choose any wireless or landline number for your five numbers. Once you register these numbers with your provider, you should be able to send and receive unlimited local calls within your local area calling to/from these five phone numbers free of charge. How does using â€œunlimited calling to five numbersâ€� with SmartReach work? Remember, when you make calls from your cell phone, you are paying between ten cents a minute (the lowest volume rate available) and thirty five cents a minute (standard overuse rate) for air time. When you call the SmartReach number (after putting it on your â€œunlimited calling to five number planâ€�) you do not pay for air time for this first leg. 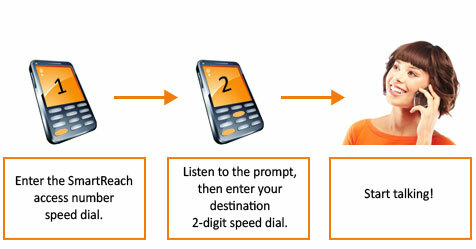 b)	When you call your destination number using SmartReach (the second leg) you are using SmartReachâ€™s land lines to make your call. This costs you less than two cents a minute. You therefore avoid paying cellular phone charges to make calls! Click here to see local SmartReach access numbers in your city. Which cell phone providers offer â€œunlimited local calling to five numbersâ€�? This service is offered by Rogers, Bell, Telus and other cellular providers. Please note: since the unlimited calling to five numbers feature is only free for calls within your local calling area, make sure to add your local SmartReach access number to avoid long distance charges from your cell provider. Click here to see local SmartReach access numbers in your city. Dial your SmartReach local access number from your cell phone. If I call SmartReach to make local calls, how can I reduce the number of digits that I need to dial? Simply assign a speed dial command to the SmartReach access number in your phone contacts list (you can also create a voice command if your phone has a voice recognition feature) and you wonâ€™t need to dial the SmartReach access number every time you need to make a call. For even faster calls, you can assign speed dials to your frequently called destination numbers in the SmartReach portal (go to â€œCreate Speed Dialsâ€�) and you can place calls through SmartReach in a matter of seconds.